Air-Flow is a product name, but so diligently incorporated into dental care that it is seen by many as a working method. Air-Flow is used to remove discolourations from tea, coffee, wine and tobacco as well as superficial coatings, including plaques. 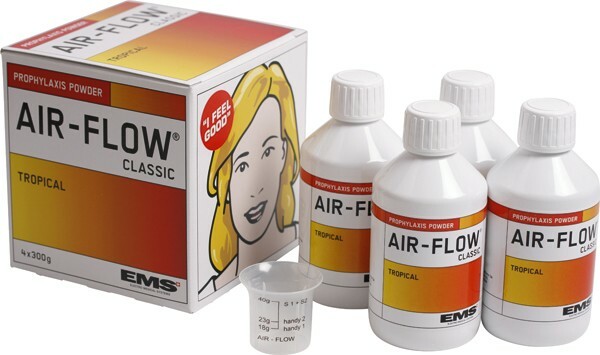 Thus, treatment with Air-Flow can be seen as both an aesthetic and prophylactic method. A spray beam consisting of water, high pressure air and flavored bicarbonate powderblows away particles and particles from the dental surfaces. The teeth are not bleached, but superficial particles that discolour the teeth are removed, which may make the tooth feel lighter. Sometimes, Air-Flow is used as a preliminary treatment for teeth whitening to remove superficial discoloration before bleaching the teeth. It may also be useful to blow clean your teeth from discoloration before deciding whether to pay for a dental bleach. The result lasts from 6 months up to 1 years. Ja. If the powder ends in the Air-Flow equipment, the dentist notices that the stains on the teeth will not disappear. That is, only water and air pressure are not enough. Inga. However, some may experience mild soreness in the gums immediately afterwards, especially if you usually feel bleeding from the gum at home brushing at home. The tenderness arises as a reaction to the bicarbonate powder encountering the gum already raised (inflamed) by bacterial coatings. The bicarbonate powder, however, helps to remove the bacteria that thawed the gum. The tenderness disappears rapidly. To achieve a long-term result, be careful with your oral hygiene and, as far as possible, avoid things that discolor your teeth, such as coffee, tobacco and some foods.